Sweet Freckles Crenshaw Melon. Golderbse Pea. Depp's Pink Firefly Tomato. I've just placed our final order for seeds for the upcoming season: a little late, perhaps, as the glasshouse is nearly full of flats with young starts inside already and, truly, we only have so much space... But, the excitement that each seed catalogue brims with this time of year, the beauty and art, the hope and promise each new (to me) variety beckons with is as powerful as a Grecian siren's call to unassuming sailors, thirsty, dreaming. The days are getting longer and, here in Northern California, at least, while we are still praying for rain we are equally and fully lured by the unseasonably warm weather, already spending full days in our gardens, harvesting miner's lettuce, winter broccoli, cauliflower, greens, and setting the table with narcissus. 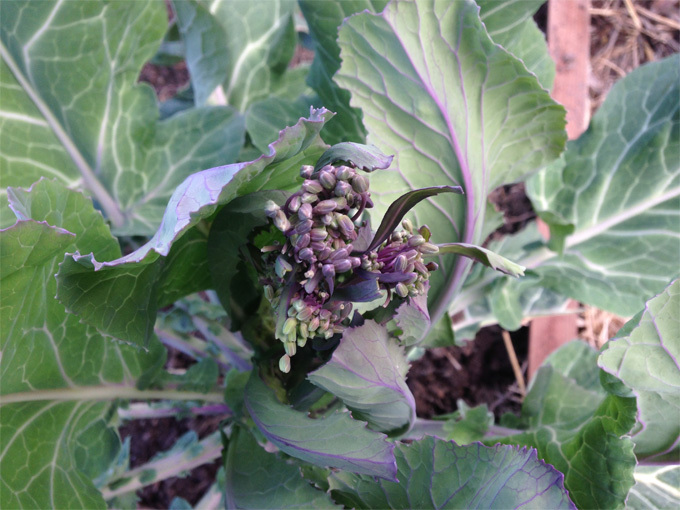 Next year we look forward to offering our first biennial seed: Willis collard greens. ‘Willis Collard Greens’ exhibits two distinct types, plants are either with or without purple coloration on the stems and leaves. This color variation is a reflection of the diverse genetic make-up that is often seen in outcrossing crops like collards. This is a 'Willis Collard Greens' plant without purple coloration. While we are investing in a small seed crop from our collards for next year, we also fully enjoyed the delectable, tender, emerging seed heads and small leaves toward the top of the stalks, as shown in the photo on the right. Their flavor is somewhat akin to asparagus at this stage. When sliced and cooked for an hour, the stems, at any stage, will be quite tender and fully edible. This info was inspired by Deborah Madison, in her book Vegetable Literacy.